Edward Jensen Jr. (1925-2017) lived a good life as a hardworking New England gentleman. But what was a day on the orchard like? Well, Ed’s day would start in the early morning, He gets his breakfast and heads out to the orchard. 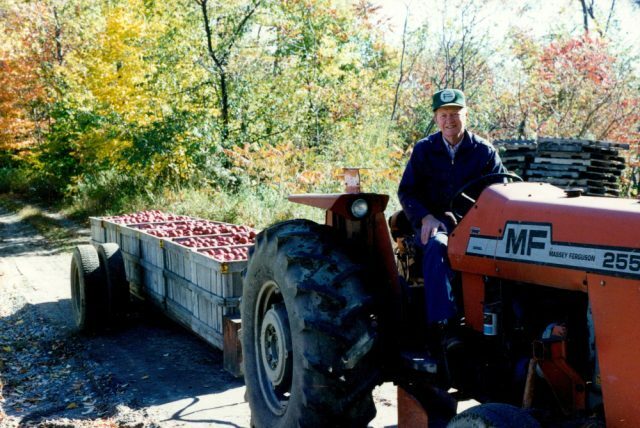 There He works with the men on the orchard doing all kinds of things from pruning so that the trees grow proper or spraying to keep away pests, to packing apples and delivering them. Then He comes in at noon for lunch and has a short nap. Afterwards He heads back out to the orchard with the men to finish what they started earlier that morning, wrapping up in the late afternoon. With his work finished for the day, Ed enjoys a family supper and relaxes watching some TV before ending his day.